Working for SHS on LINPAC's Featherstone site ( and others ). 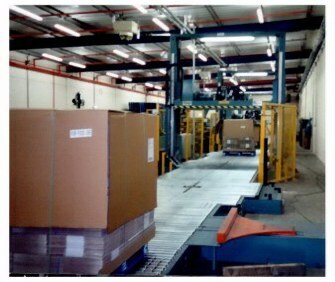 Linpac's Featherstone factory near Wakefield in Yorkshire… In the first photograph you see a box coming into the strapper. It must be stopped with precision so that the lances can fit through the spaces in the bottom of the pallet. 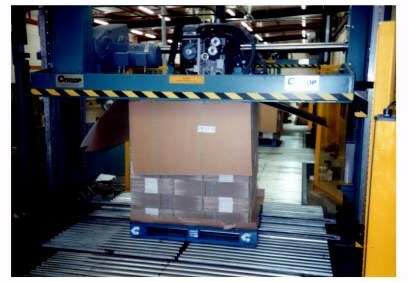 If it is a load such as this one then this is described as a 2x2 - meaning that the first strapper is to put to straps around the load, and then the turner ( the cross that you can see in the middle of the conveyor ) can turn it the box through 90o ready for the second strapper to put the second set of straps over. In fact what you are looking at is the second strapper because the load in the foreground already has both sets of straps. The load must be re-turned to it's original orientation for final departure down the conveyor line. The strapping configurations included the most common 2x2, the 3x0, the 4x0 and some more in between. Each strapper must be capable for doing all the straps if the other is out of action and each operation down the conveyor is asynchronous. A memory system as to where each load is up to had to be adopted to ensure that the strapping configurations where achieved. The loads could come down in any order ( 2x2 followed by a 4x0 etc … ) and it was up to the PLC to ensure the loads where stopped in the correct places on the conveyors for the lances for the straps ( and jogged if the sights through the pallets weren't clear ). It controlled the turners and told the strappers whether to do put to straps on or just one and kept a track of all the machinery - it also interfaced with a operator station - so that the operator could jump in and adjust things if necessary. As is very common with a lot of the systems with which I get involved, the job expanded and expanded taking on more and more of the control of the conveyor system, the polythene rotatory wrapper, the fork lift take off areas all were done with my own version of software that proved to a lot more sophisticated that the stuff that was previously used. But the `piéce de resistance' was the control of a conveyor system that was called `Staktrac'. This was the most exciting area of control that I worked on in this factory because the sophistication of the control meant that the hardware design of the conveyor system could be greatly simplified. With my control system the loads could be jammed back to back on a conveyor without the need to brake the rollers from the underside and the take off of the loads could be done crisply without the need of a separate take-off conveyor. Furthermore the logic could be extended to any length of `StakTrac', which previously had to be coded a different way. The saving in the new approach were many fold; mechanically the conveyors could be built without brakes, on a standard length conveyor there were five sensors that I didn't need to use, and the take off section of the conveyor ( with it's separate motor ) all were redundant. Finally the other area of saving was the ease in which the loads on the conveyors could be pushed around because they were un-braked - this had huge saving on labour because previously the only way to get the loads moved manually on the conveyor was to turn off the isolators ( which would drop the brakes off ) and then restart the conveyor - where upon the conveyor couldn't rebunch all the loads. At the end of the need for my involvement in Featherstone, I went on to other sites and put in the new coding in these other sites. It was a shame that the money became a problem with my involvement in SHS - because the changes I was ringing there were very revolutionary. My thanks to SHS. Hello to Jerry Matthews, Alan Tomlinson & everybody else at SHS I had the pleasure of working with.